Welcome to our school website. We hope you will enjoy browsing through the web pages and that you will find lots of interesting information about our school. At Valley End C of E Infant School we believe that all children are born with potential and that every child is unique. We believe that there are no limits to learning and achievement. Please click here for our Vision For Learning. 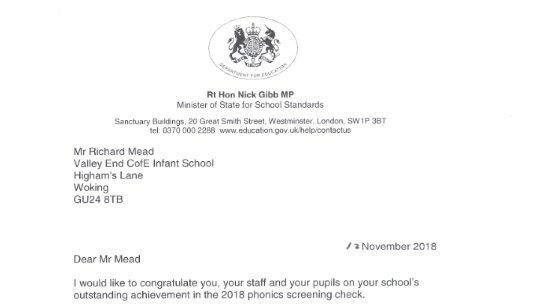 We recently received a letter from Nick Gibb MP, Minister of State for School Standards, congratulating us on our standards in phonics and early reading. 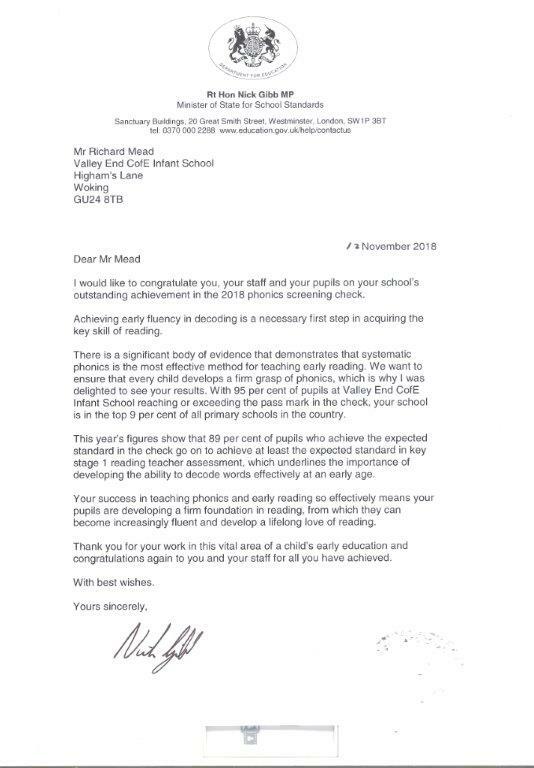 Our vision at Valley End C of E Infant School is to constantly strive to enhance and develop teaching and learning and our strong Christian ethos. Building on our educational legacy, we aim to continually create opportunities to extend and to personalise learning for the whole child. Our school community will continue to enable children, parents, staff and governors to thrive educationally, professionally, spiritually and personally through an aspirational, caring and child-centred environment. Year 1 and year 2 children return to school.